These notes compliment the information within the posts. At the time of writing AUD$1.00 was Mauritius Rupee MR29.00. Hope they are of use to you when you sail into Port Louis! Call for port clearance on channel 16 upon arrival at the entrance to Port Louis. Go directly into the port where you’ll see Caudan Marina on your starboard side and the customs office to the port side. Tie up on the high cement wall and before long the customs guys will find you. At this point they can arrange for Immigration, Health, etc. to come to you. There was no cost for arriving in Port Louis (even on a Sunday). Once you’ve cleared in (which is a straightforward process and lots of forms to fill in), you can move across to Caudan if there’s room or head straight up to Grand Bay or south to Black River. Plenty of fuel stations around Port Louis with the cost for diesel/ULP around MR42/MR52 (A$1.5/$1.80) per litre respectively. Two fuel stations in Grand Baie easy to get to, but diesel and ULP also available at the yacht club. The fuel jetty at the yacht club isn’t suitable for deep keeled vessels. Easy to have items sent here and held for collection. DHL Mauritius Limited, Cnr Mgr Gonin / Sir Virgil Naz Street, Port Louis, Mauritius, Tel: +230 208 7711 / +230 800 7711 Fax: +230 208 5330, Customer Services: +230 208 5330. 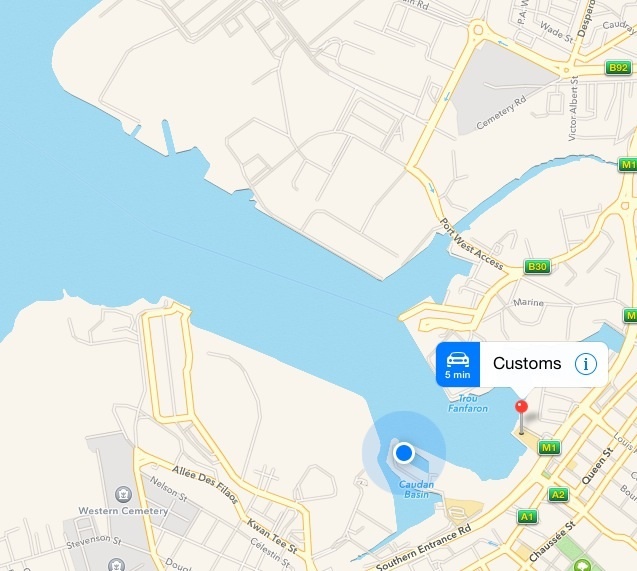 Remember to mark your incoming packages as Yacht In Transit to avoid customs fees. Free membership to all passing yachts for the first month then MR500 after that. Access to dinghy dock, showers, drinks and restaurant for lunch. Dinghies are pretty safe here. They also have fuel (diesel and ULP). This photo shows the large buoy at the entrance to Grand Bay. We kept this to starboard and headed straight towards the yacht club before turning starboard into the bay where it depends to around 8m. At high tide (0.6m) we had 0.5m under our 2m draft. Gerard Monet, Monet Car Hire, e-mail : admin@carhiremauritius.io, Web Site : http://www.carhiremauritius.io, Tel: 00 230 5251 1802 – reasonable rates. He will drop car off at any location around Mauritius. Many car hire places around Grand Baie slightly cheaper. Nice bloke! We had stainless welding by Integrity Metal Works Ltd, Marine Road, Albion Docks, Port Louis, Mauritius, Tel: +230 216 9321, contact@integrity.mu, http://www.integrity.mu. Good job and a short ten minute walk from Caudan. From Caudan, a short walk is the bustling Winners Supermarket (behind Air Mauritius office off Pres. John Kennedy Drive). The quieter Shoprite (at the eastern end of the Company Gardens) is a good alternative. A 15min walk south along Pres. John Kennedy Drive is CityWay supermarket with a good selection of food and items and not so hectic as Winners. 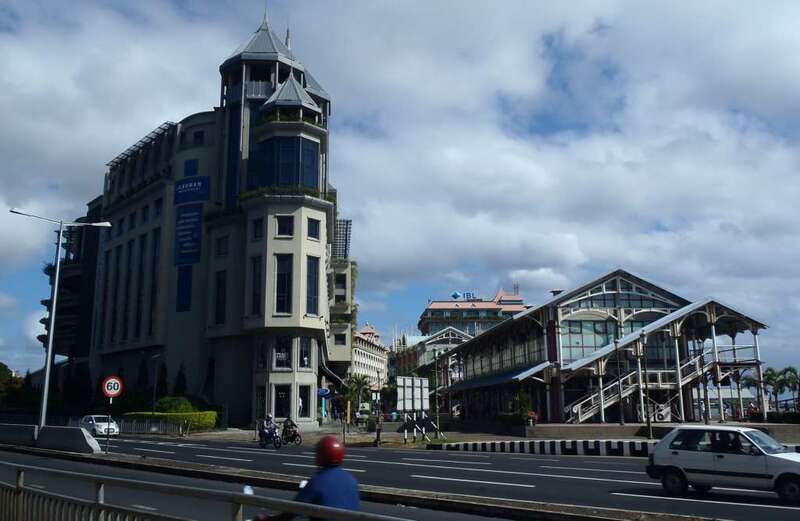 There are plenty of western style shopping complexes outside Port Louis. Grand Baie Shop 2000 is close to the yacht club, although their veggies aren’t particularly good. Super U is the closest and has a good selection. Similarly La Croisette mall has a large supermarket and is a 1km walk from the Coast Guard station on the southern side of the bay. A large Winners at Pereybere, 2kms north of Grand Baie. There’s plenty of hikes down at the Black River National Park, however we didn’t do any as it’s a little difficult to get to without a car. We drove through and it’s very scenic. 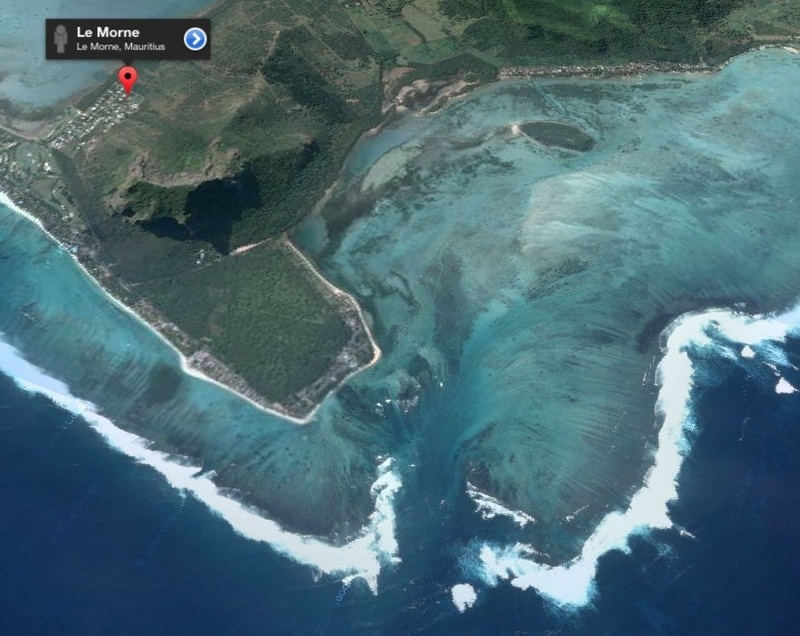 Le Morne in the south is impressive and there’s heaps of kite surfers to watch. Le Pouce is a nice walk following blue/white painted markers along the way – take a bus to St Pierre (near Moka) and ask them to drop you off at the trailhead. From there it’s a 1.5hour walk to the top. The pinnacle at the top (1900m) is a little slippery but doable. 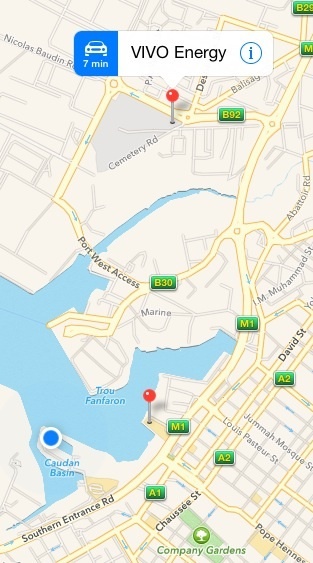 The track then heads down to Port Louis and takes about 2 hours to the outer suburbs. Signal Mountain is the closest to Port Louis. There’s no trail but there is a sealed road to the top. It offers great views of Port Louis and is good for exercise. The Citadel/Fort Adelaide is a short walk east through town and steps take you up to the fort with good views of Port Louis. I’d recommend early morning. We chose Emtel for our internet. We each bought 5Gb mini-sims for MR1249 (around A$40) for one month (data only). Note: If you have an iphone, only some carriers allow you to use ‘personal hotspot’. Emtel is not one of them! I believe the alternative provider, Orange, may have this feature. At the time of writing this, there was free wi-fi within Caudan Marina complex. Fee for 12m yacht MR300 (about A$10 per night). Water, electricity is available if you can get it, and hot showers are close by. Good security and friendly security personnel, although watch the tourists stepping on your boat for photo opportunities. Hardware stores or “Quincaillerie” – plenty of them around Port Louis and beyond, although you’ll find pretty much anything within China Town, Port Louis. By the time you’ve arrived at Port Louis you’ll have been met by a fellow named Deodath Goreba. He can do laundry for around MR120 per kilo (about A$4 per kilo!). By all accounts (not mine) he’s very good and your clothes come back ironed – including your undies! The Caudan Marina office I understand can do washing for you for MR80 per kilo, but it’s only washed. Alternative is to wash by hand every few days. No problem hanging washing out, although it may pay to hang your smalls discreetly! Local taxi driver and man-about-town is Rashid. He will appear out of the shadows when you arrive, but for the cautious cruiser, perhaps consider using his services after you’ve got yourself sorted. We found his taxi service much more expensive than hiring a car and didn’t actually end up using his services for that reason. There are other guys that offer a similar service, however, for a resourceful cruiser, you can usually get by with a little research and a bit of time. We opted for buses to get around and didn’t use any taxi service while in Mauritius (but there’s plenty of taxis, sure enough!). Two main bus stations in Port Louis are the Transportation Centre (which caters for northern buses) and Victoria Square (southern buses). Both are a short walk north or south of Caudan. There’s a number of different bus operators and the fare is generally no more than MR35 for each time you hop on a bus. Tickets are paid for on the bus. Loved Mauritius! What a great place, friendly people, and a mix of modern and old, and different ethnicities. Great place to spend extended time during an Indian Ocean crossing or even a normal 2 week holiday – 9/10.